Every Friday I dig into the archives and dust off an old post. As I type, the eastern seaboard is preparing for Hurricane Matthew. Even if certain regions escape wind and flood damage, it’s almost certain that most of us are in for a rainy weekend. Which makes it a perfect time to pull out this archived post. Sometimes, the rain falls. And when it falls on a weekend, it’s never a good thing. Outdoor plans get rescheduled, yard work gets postponed, and church people get cranky. Church people don’t like rain; especially Baptists. For people who believe in immersion, we sure are scared of a little water. So when the forecast calls for drizzle or the bottom falls out on the way to church, you can be sure that at least a few attendees aren’t going to be happy about it. Which is exactly why you need an umbrella brigade. 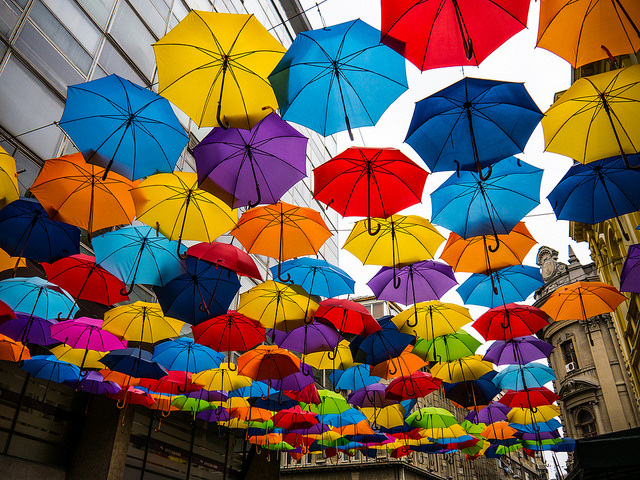 A team of happy volunteers in rain-proof boots and colorful umbrellas can deliver more “wow” per square foot than just about any other initiative you can come up with.